A three-day exhibition on the teachings of the Quran by Ahmadiyya Muslim Jammat, Delhi, that opened at the Constitution Club here on Friday ran into trouble when All-India Muslim Personal Law Board member Kamaal Farooqui and Syed Yahya Bukhari, brother of the Shahi Imam of Jama Masjid, along with their supporters denounced the event for “wrongly interpreting the tenets of Islam and the holy Quran”. Talking to the media outside the Constitution Club, Mr. Farooqui said since Ahmadiyyas have been branded as non-Muslims in Pakistan, Iran, Iraq and other Islamic countries they cannot mount an exhibition in which they have interpreted the teachings of the holy Quran. “If we start interfering in other people’s religion as it is being done through this exhibition, then it would create a dangerous precedent in the country. This exhibition cannot be allowed at any cost. Today we are demonstrating peacefully, but if this exhibition continues then on Saturday there will be a bigger demonstration,” he warned. 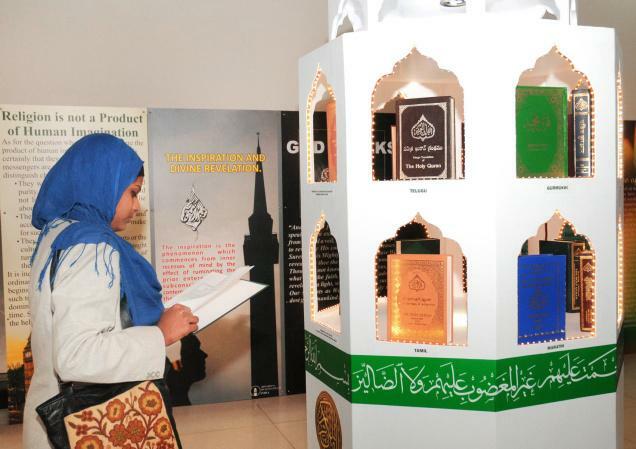 The exhibition is displaying the Quran in 53 Indian and foreign languages including Kashmiri, Tamil, Telugu, Marathi and Gurmukhi, Russian, Spanish, Korean and Vietnamese. Seeking to dispel misunderstanding surrounding Islam, the exhibition is highlighting the tenets of Islam. “We want people to know that Islam stands for peace,” said Ahsan Ghori, while presenting the exhibition before guests. The exhibition highlights that Islam has assigned a position of dignity and honour to women and is a peaceful religion.